We were inspired by a #WiningHourChat to give Spanish Rioja wines a try. We’ve seen them in the stores before but we’ve noticed they usually cost more than the other wines. 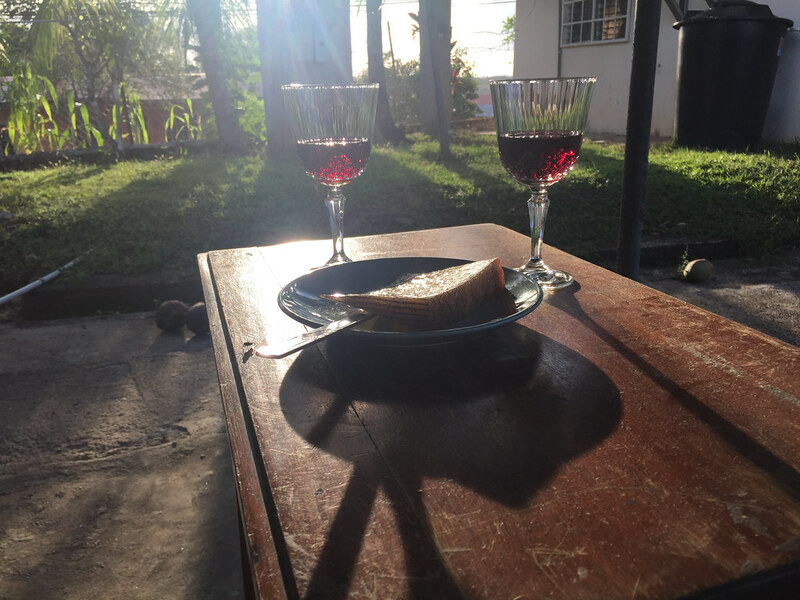 Here in Panama, the wines are significantly less expensive than we have found in other parts of the world so it was our chance to pick up a bottle. The cheese we chose to pair with it also hails from Spain. We didn’t know much about it other than the fact that it would be harder cheese. Sounds good to us! 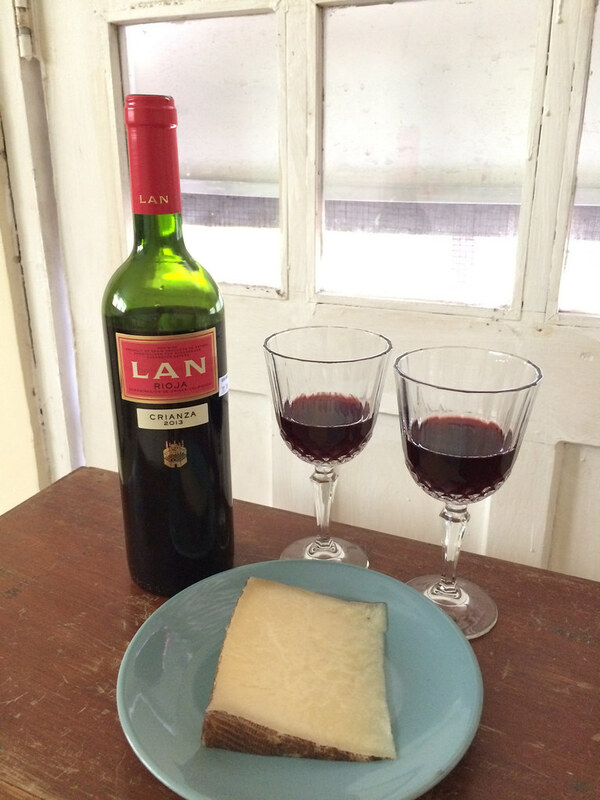 Have you tried pairing wine and cheese by country before? Why not give it a whirl next time you are in the store? This wine had many aromas jumping from the glass as we swirled it. I picked up cherry, earth, smoke and graphite notes while Neil noticed cherry cola and smoke. I found this wine to have a lighter texture and then compared the aroma to a Beaujolais wine. Neil was reminded of Cherry Cola as he sipped the wine but also found it to taste like smoke with a dry, lingering flavor and a hint of spice. I agree with it being a dry wine with a spicy finish and added that there were tart, slate flavors. We both called it a good wine and were happy to have tried it. Our neighbor saw us tasting the wine outside and came over for a sip. She said it was strong and burned on the way down but admittedly she’s more of a sweet wine person. Since Rioja wines are new to us, let’s hit the internet and do a little research. Rioja is the region in Spain where the wine is produced. Tempranillo is the main grape that’s usually used but Garnacha, Mazuelo and Graciano will sometimes be added in smaller quantities. When I’ve seen of Rioja before, I remember the word Crianza, but if that’s not the grape or the region, what is it? Crianza is one of the four levels of Rioja wines that are classified by how much time the wine ages in oak. The wine we tried during this pairing was Crianza which means it spent a minimum of one year in oak and then aged some amount of time in the bottle. See how much we are learning here! Ready to learn about the cheese? The Castellano cheese, produced by Quesos El Pastor, is made from raw sheep’s milk. As we looked for aromas of this cheese, we made note of funk, salt and milk. Throughout our cheese tasting, we have learned that many cheeses can benefit by adjusting to room temperature. It’s HOT in Panama so Neil felt this may have gotten too warm. He said the cheese was a little bit salty and funky but just ok. It wasn’t really what he was expecting. I found a strong, flavorful funk, salt, milk, tanginess and a flavor that reminded me of grilled cheese. The cheese was dry with a medium texture and coated my tongue. I was excited to pair it with the wine to see how they affected each other. FYI, this cheese does not have an edible rind, it was too waxy. The combination of Rioja with Sheep Cheese, worked very well together! I felt the wine smelled very berry but tasted dry and earthy with a berry finish. The cheese got drier too but then reminded me of the flavor of fried food at a fair. Neil thought the wine became more tart and the creaminess of the cheese came out. He also found the wine to become earthy. We both liked this pairing. Yum! When we’ve spoken to other fans of wine and cheese, people have suggested that wines and cheese from the same region usually go well together. What grows together, goes together! This is something we should keep in mind because it was definitely true for this pairing.